Anatomy, mapping, diagnosis, surgical treatments and practical training in lymphedema. Lymphatic microsurgery is a field experiencing a continuously growing interest within the plastic surgeons community. 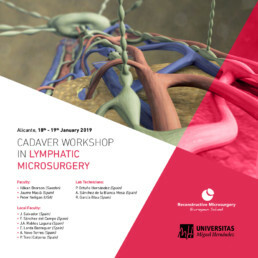 This practical course focused on lymphatic microsurgery including over 15 hours of practical training fresh cadaveric material (with only 2 dissecting participants per operating table) is designed for residents and specialists in plastic surgery (worldwide) to learn or further refine their skills in lymphatic microsurgery. One of the most challenging caveats to achieve success in lymphedema treatment is learning to perform the microsurgical lymphatic procedures from intraoperative identification of lymph vessels to performing lymphovenous anastomoses or harvesting a vascularised lymph-nodes to be used later on the same patient as free tissue transfer. Such skills can only be learned and mastered in the laboratory on experimental animal models and then further refined on human tissue. The course consists mainly of practical exercises which will be performed under either loupe magnification. The first practical session starts with a detailed introduction of the Lymphatic System, Physiopathology of the lymphatic system, the way to assess the lymphedema patient and the patient selection of lymphedema surgery followed by the way to rise the different types of vascularised lymph nodes. 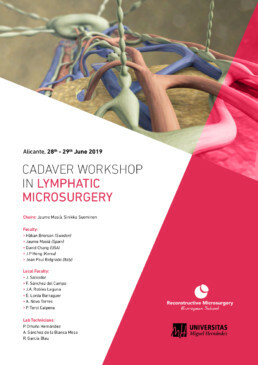 The second day is dedicated to solve problems and the follow up in lymph node transfer, the way to perform a lipoaspiration in lymphedema and lipoedema patients and the surgical concepts of the Lymphatic disorders followed by practical exercices in the recipent vessels for lymph-node transfer. Professor and Chief of Plastic Surgery Department, Hospital de la Santa Creu i Sant Pau / Hospital del Mar (Universitat Autonoma de Barcelona). Director of Reconstructive Microsurgery European School. Educacional Committee Chairman of EFMS. President of the scientific board of BeLymph. Member of the International Society of Lymphology (ISL). Assistant at Faculté des Sciences de Motricité – Lymphology Research Unit of the Université libre de Bruxelles (ULB). Scientific adviser of the Lymphoedema Clinic in UMC Sint-Pieter (Brussels). Plastic and Reconstructive Surgery, Skane University Hospital, Malmö. Department of Clinical Sciences, Lund University, Sweden. Professor of Plastic and Reconstructive Surgery at the University of Ulsan College of Medicine and Asan Medical Center. Active member is number of professional associations such as American society of plastic surgery, World society of reconstructive microsurgery, and Korean society of Plastic surgery. The Faculty of Medicine at the Miguel Hernández University mission is to train future health professionals with criteria of excellence on a scientific and human level, fostering the acquisition of skills and adapting them to the growing needs in today’s society. The Faculty of Medicine is conceived as a teaching and research center committed to society, with critical scientific thinking and directed towards the student and patients. Our primary aim is quality. Quality in teaching and quality in research. Quality understood as factor of progress and continuous improvement of all university functions and activities: teaching, teacher training, research, infrastructure, service management, etc. Alicante is centrally located on Spain’s Mediterranean coast. His privileged location offers to the city an excellent mild climate, with an average year round temperature of 18-20° C.
The air of the city is pervaded with the scents of the sea; indeed, the city has been an important seaport for many centuries. The city looks towards the sea, and does so from its famous Paseo de la Explanada, one of the most beautiful seafront promenades in Spain. Alicante is also a university city, with various faculties and a series of technical colleges. In summer a variety of Spanish courses for foreigners are held. Once the registration is done, you must come back to this page and fill in the form above with your personal details and a copy of the registration’s receipt. Please, if you prefer to do your payment through a bank transfer, do not hesitate to contact us.